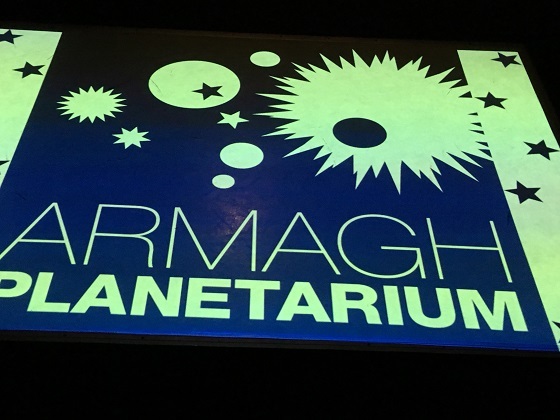 I remember visiting Armagh Planetarium as a child – another lifetime now. I was so impressed then, blown away by all there was to see and loved that experience of finding out more about space and the solar system. 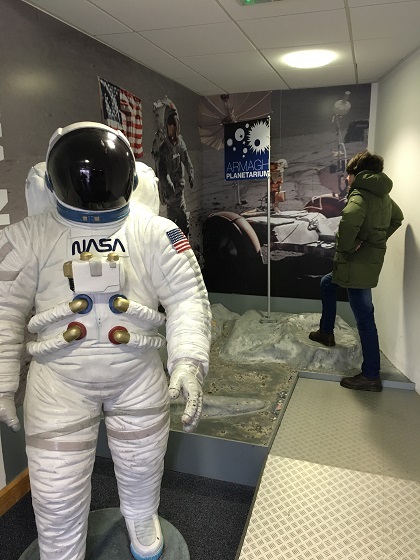 A visit to see family in Northern Ireland over half-term, we had dismal weather one afternoon so decided to go to the planetarium and check out how it had changed. Entrance is free, you just pay (if you wish) for the shows in their Digital Theatre. We had a look at the show schedule picked the one we fancied and then set off to explore. There are a few galleries but I have to admit to being a bit disappointed. A lot of the interactive displays weren’t working and some areas looked more than a little tired and in need of a revamp. 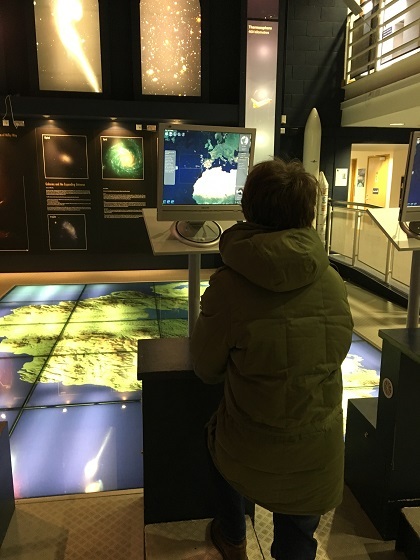 Son discovered one place where the information on display referencing a future event had already happened – not very good. We did though discover the largest meteorite in Ireland. 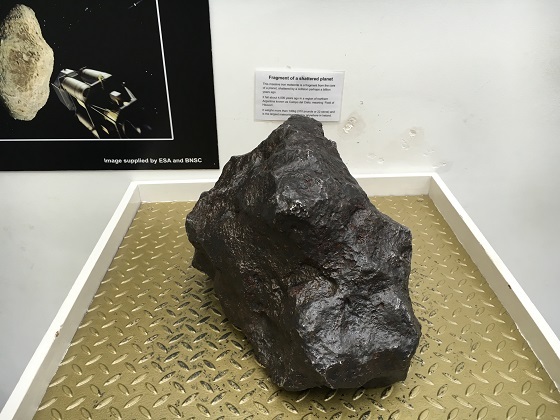 You can touch it and at 4.6 billion years old you can’t fail to be more than a bit impressed. 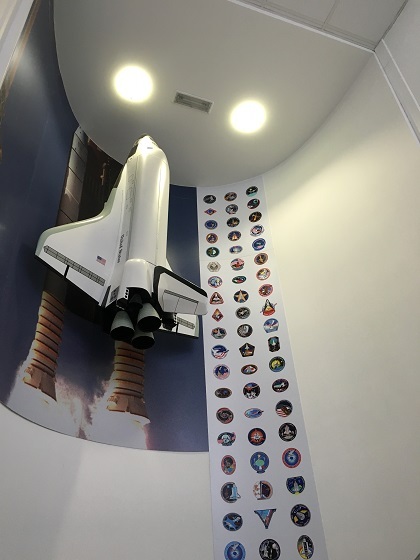 Son quite liked the scale models of the International Space Station and the Hubble Space Telescope. They were quite interesting but not mind blowing. In comparison to other places of this type we’ve seen, it all felt just a bit underwhelming here. It is hard to be overly critical as entrance is free but I would rather pay an entrance charge and have a better experience…. The highlight of our visit was definitely the show in the Digital Theatre. We reclined our seats and gazed up at the massive dome. A great guide talked us through the night sky and showed us what we could expect to find in that area on that evening, should we decide to do a bit of star gazing – I loved that. She talked about some of the myths of star-gazing too which was fascinating. The finale was a film on the ceiling about space – also interesting, the whole experience lasted half an hour or so and was very well done. The rain had stopped at this point, we decided to go outside and have a stroll around their Astropark. There is a scale model of the universe, you can walk around and through it – interesting to see the “proper” distances between each planet. The whole place though was more than a little unkempt with long grass, some litter and some of the models looked a bit battered and worn. A mixed day out really. The whole place wasn’t how I remembered and is just a bit lacklustre. It seems like a injection of funding might be needed here, the exhibits definitely need improving and as I said before, paying an entrance fee might help with this. The Planetarium, as far as I know, is the only attraction of its type certainly in Northern Ireland. It has the potential to be really great, it just isn’t right now. Son enjoyed it though, so not a fail. Seeing the largest meteorite in Ireland would be cool! That’s disappointing to hear about the rest of the museum though. 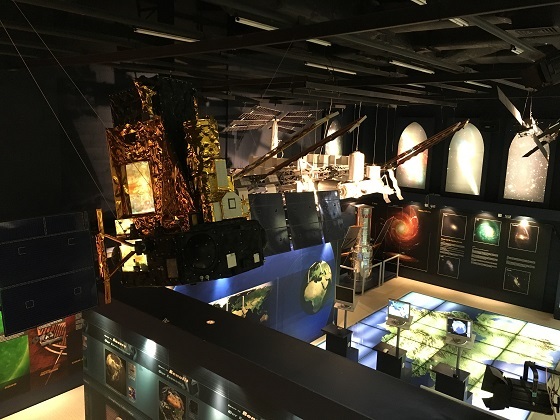 After visiting the Air and Space museum in Washington DC, every other museum of that type hasn’t been quite as good. 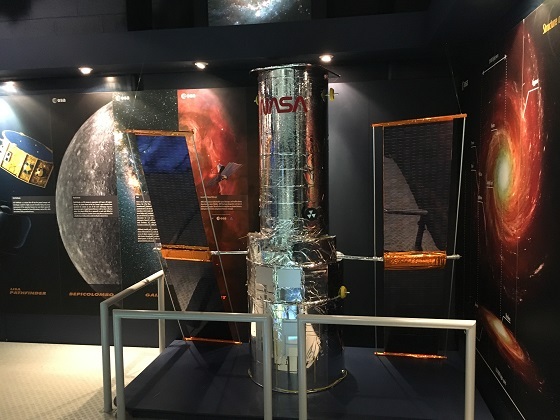 We visited that museum in Washington some years ago and were blown away – (and spoiled) – as you say, nothing lives up to that!! Our son did enjoy himself Rosemary so that always makes the day out worthwhile!! What a shame about the Space Station – would have been great to catch a glimpse for a little while no matter how distant!! That’s the sort of thing we love to do. Nice to lay claim to the lights in the pictures too!! Hope your weekend is a lovely one too Rosemary. 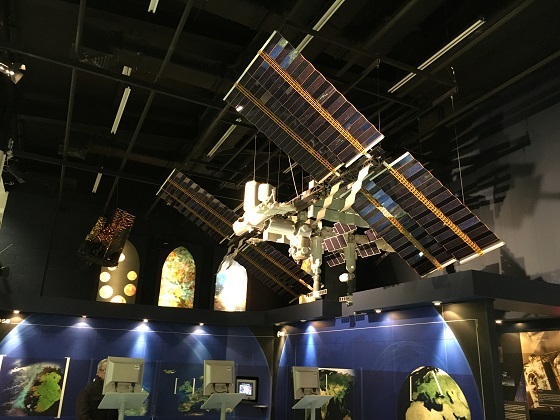 Such a pity the museum didn’t live up to expectations but viewing the meteorite must have been impressive. The star gazing sounded interesting though, learning what we might see in the night sky. Hope you have a good weekend now that the storm has decreased. The star gazing was incredible and to have the expert chatting and talking about what we could see was really great. The museum was a little disappointing but it was still a fun day out. Glad that Doris has gone now, my father was staying with us and due to travel home yesterday but had his flight cancelled. He’s due to fly tomorrow but we’ve just heard gales and persistent rain is expected overnight – fingers crossed it’s not as bad!! Hope your weekend is a good one too. Hope your father’s flight runs to schedule tomorrow. At least it’s a bonus having a father / granddad around a little longer as time with them is so precious. It’s been quite a new CEO day here today. Some times it is necessary to be disappointed so that we appreciate the really good experiences! I like that idea! It is so true Andrew. Thank you – there were pros and cons about this place. I’m from Ireland and have never heard of this! 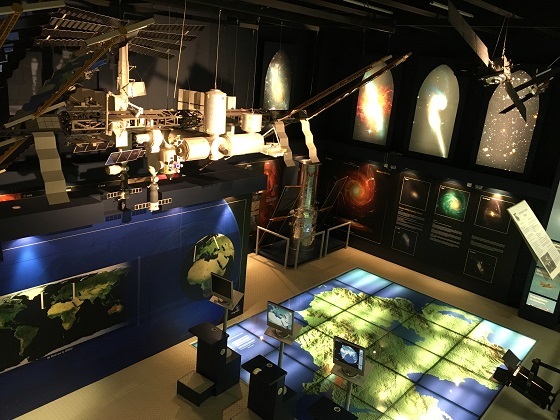 Next time I’m home, I’ll go up North and go to it- I love visiting planetariums for the films on the domed screen so glad to hear you enjoyed that part. Wishing you a wonderful weekend! The film was good Laura and the guide explaining about the night sky was really interesting. The rest of the place is not so great but it is free so nothing to lose!! Also if you went in summer there are other things to do in the area!! Hope you have a great weekend too. I am sorry you found the planetarium in need of attention. A fee would certainly generate funds to bring it up to its potential. It sounds like you all made the nest of your afternoon. It was a nice afternoon Pam despite things not being so great there. We enjoyed the film and a day out is always fun and an experience no matter what!! Good honest post. The meteorite does sound impressive but it sounds like a modernisation is perhaps on the cards. That is exactly what it needs! Sounds like they need to take things up a notch! Very cool about the meteorite, though. If just for that.. 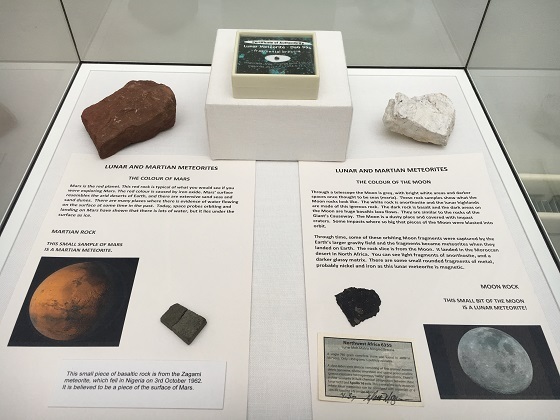 Totally agree Corey – but yes, the meteorite was very cool. Oh wow, it’s yeeeears since I was last in this place! Does the shop still sell astronaut ice cream? It’s a shame it’s in need of a little TLC, but it’s good to hear that the star shows are still with checking out – I used to love those! Still selling that ice-cream – we bought some this time too!! The show was a real highlight and every bit as good as I remembered. The rest of the place…. well it’s a shame really. I remember going to the planetarium at the Boston Science Museum with my class many many many years ago. I still remember how awesome it was! I’ll bet they had a superb planetarium there!